Early childhood caries is a devastating form of dental decay affecting children below 5 years of age. The reason has been linked to poor oral hygiene practice, improper feeding habits, lack of parental awareness and avoiding dental visit. Poor oral health can affect the general health of the baby as it can cause problems in eating leading to low weight of your child. Dentistry has evolved to a point where prevention of dental caries is now achievable. However, this requires an early start, as early as, when the child is in the mother’s womb. Here are few guidelines that you must follow, to ensure good oral hygiene of your child. It has been proven scientifically that there is a relationship between oral health of mother and that of the child. Pregnant women need to be vigilant about their oral hygiene. In case of morning sickness and vomiting, rinse with water and baking soda. The child’s first tooth erupts at the age of 6-8 months. Teething signs may include irritability, drooling, excess salivation. To comfort the child during teething use a clean and chilled teether which was refrigerated, cold and thick carrot or cold and clean cloth to bite on. Introducing dentistry as mentioned above will ensure good oral health, positive dental attitude, good rapport between your child and dentist all of which will eventually enhance general health. Healthy mouth is necessary for healthy body. Dr. Nirali is committed and passionate towards ensuring kids receive quality dental care. Her practice focusses exclusively on providing the warmth to children to make the dental experience a pleasant one. 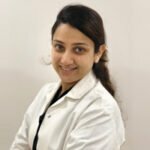 It is her moto to ensure that the dental appointment ends with a smile on child’s face along with developing good oral hygiene routine and a balanced diet.